There’s nothing like coming home from work, knowing that you’re about to sit down to a mid week roast lamb dinner. The smell of it as you open the door, in the dark, at 5pm after a hard day in the office, tis like manna. 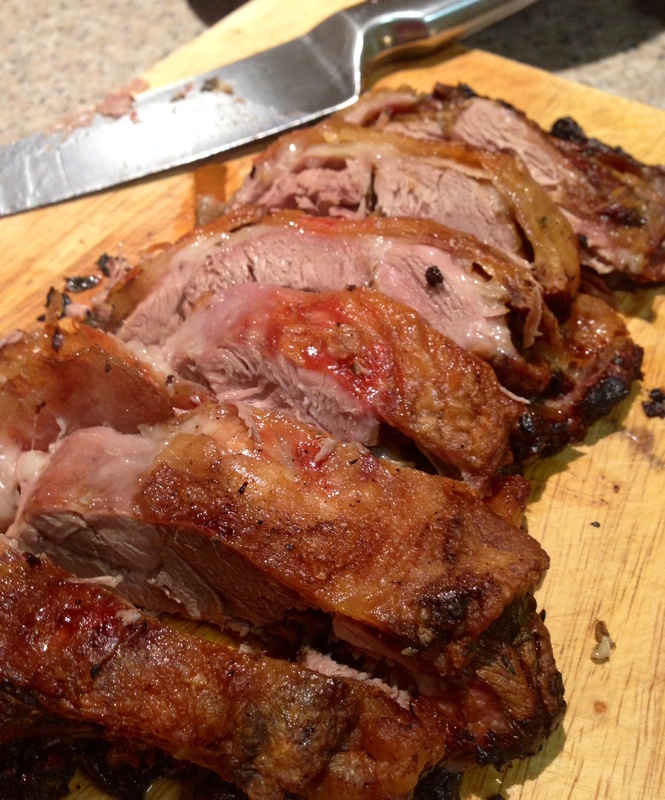 In the case of this slow cooked roast lamb, I can honestly say its one of the best I’ve ever eaten. And cooked. It was fortuitous in that I wasn’t supposed to be home, but the delivery of my oven meant I had to duck home to let the delivery dudes in. So, not only had I scored a boned shoulder of organic lamb from the markets for 50% off, I had enough time to finish off a bunch of pickled Italian eggplants, and put the lamb on to cook. The pickled Aubergines aren’t really related to the story, but the the pickling process is. The ingredients for this lamb dish were a 1.2 kg boned shoulder of lamb, I don’t normally buy organic, it’s a bit too exxy, but this was a good buy. Can I say that it was so succulent and tender and tasty because it was organic? I’m not sure. I’ll have to do a do-over on this recipe with a non organic shoulder and see if its just as good. 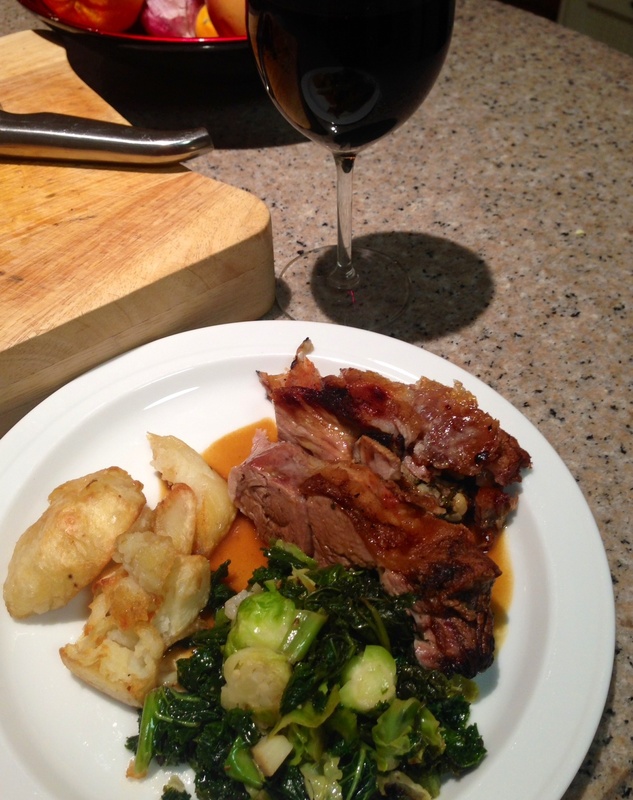 The lamb was sweet, moist, tender and savoury and the crackling, after being in the oven, finishing off, oh my god! Crunchy, salty, crispy lamb crackling…Sorry, the rest of the ingredients were a couple of big garlic cloves, rosemary and thyme from the garden, and the leftover red wine vinegar, about 3/4c, drained from the soaking eggplants, from the pickling process. Can’t throw anything out, me. Lots of salt and pepper, and a couple of tablespoons of honey. 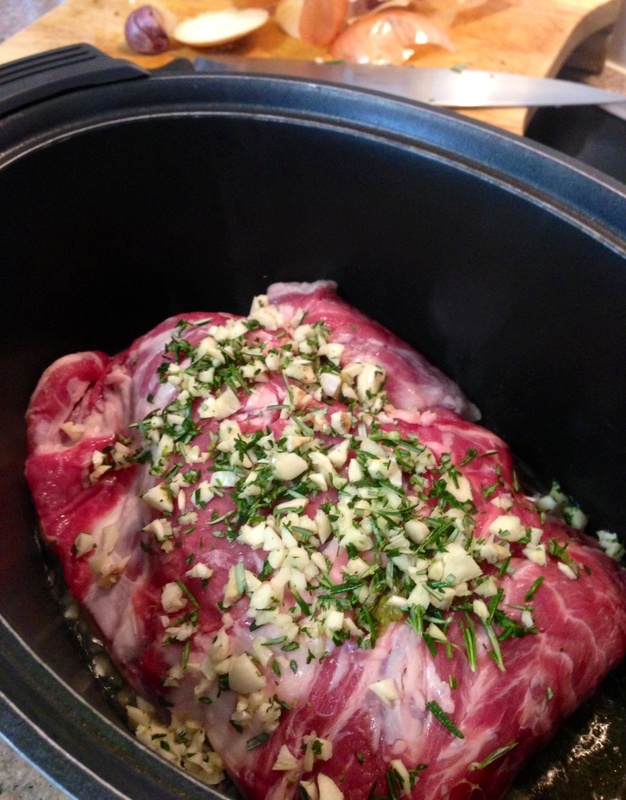 Chop up the garlic and herbs and rub them with lots of seasoning all over the lamb, except the fat. 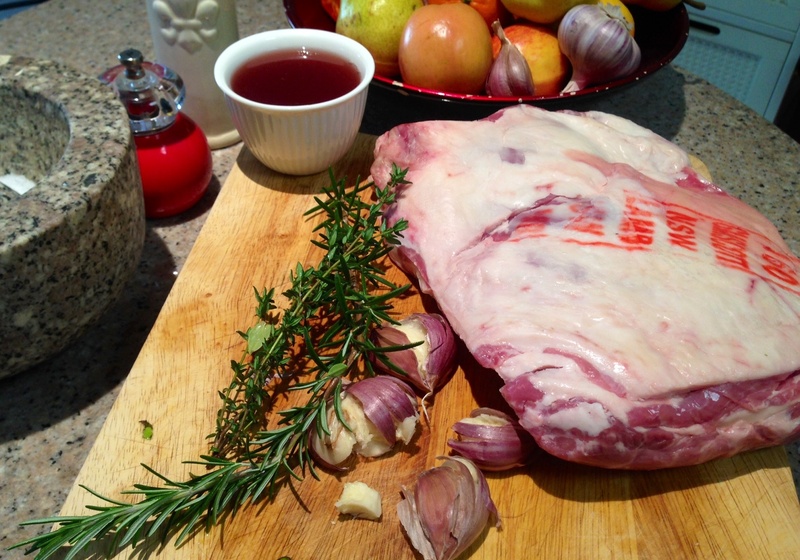 I didn’t use much oil as lamb is generally fatty and the rendered fat I used to baste whilst browning. I sear my meat for slow cooking, but it’s not necessary. You can just bung it all in, turn it on and dish is done, but I like to get some caramelisation done to start it off. Brown for about 10 minutes, turn it over and sear for a few minutes, add some chopped onions to the pot, and pop the lamb on top of the onions to keep it raised as much as possible out of the liquid. Add the vinegar and the honey, put the lid on and cook for 7-8 hours on low. When I got home from work, I par boiled some potatoes and put them into a hot oven with duck fat to roast until crunchy and soft n fluffy on the inside. To finish off the lamb, remove it from the pot and put in the oven for the last 15 minutes with the roasting potatoes, to crisp up the fat, and caramelise the outside bits. I love, love, love the outside caramelised, almost burnt bits on roasts, they’re my favourite, and a real cooks treat. Cut them off and eat them while no ones looking. To make the gravy, or lamb jus 😉 push the liquid and onions through a sieve into a bowl to get as much liquid as possible. Put this container in the freezer for 10 minutes, this will solidify the fat and make it much easier to remove as much fat as possible. Put the fat free juices and a cup of chicken stock into a saucepan and boil vigorously until nice and thick and sticky. Add a bit of cream and season to taste. 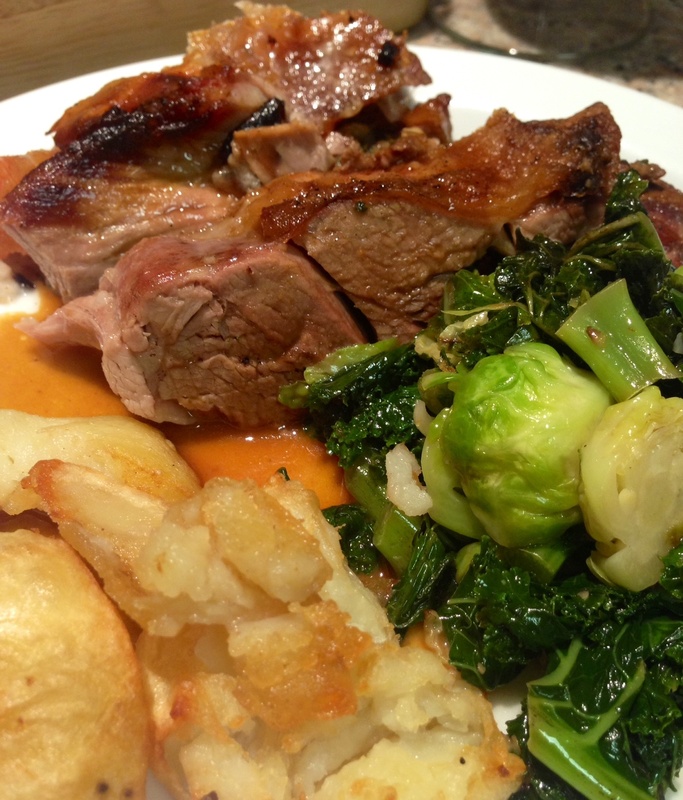 Serve the best ever slow cooked roast lamb with the best ever duck fat roasted potatoes, sautéed kale and brussel sprouts with garlic and lashings of the sticky, vinegary, honey lamb gravy. 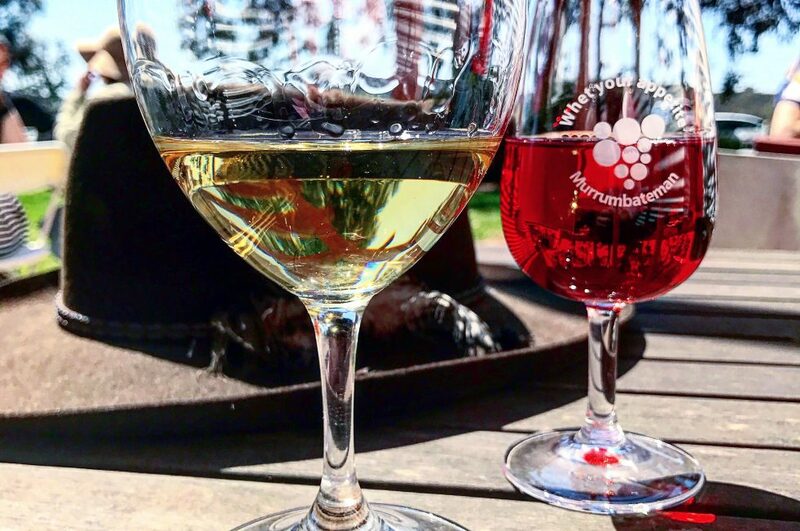 And a big glass of red. You will not be disappointed. Next Post Brussel sprouts, cauliflower and chorizo spaghetti, who would’ve thunk it? 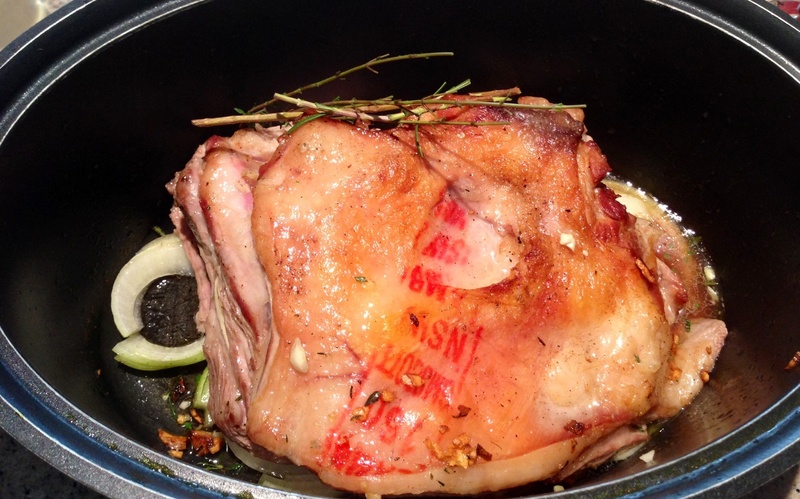 I’ve been on a kick of rubbing the lamb with a bit of Herbie’s spices but now I want to make this!